Amidst the raging controversy surrounding Kerala's Sabarimala temple, a 34-year-old Kali Puja in Kolkata is now getting media attention as it doesn't allow women to step inside the marquee premises, with belief reigning stronger than rights. "Our 34-year-old Panchamunda Kali Puja follows tantra (an ancient esoteric Hindu tradition). Tantric priests from Tarapith have been conducting the Puja every year. We had questioned our ancestors, but they said a female is not even allowed to touch anything," Gangaram Shaw, executive body member of the Chetla Pradip Sangha, told IANS. Kali Puja -- which is celebrated as Diwali in Bengal -- is scheduled to be held on November 6. Shaw mentioned that the restriction on entry has been there ever since the Puja was first held. 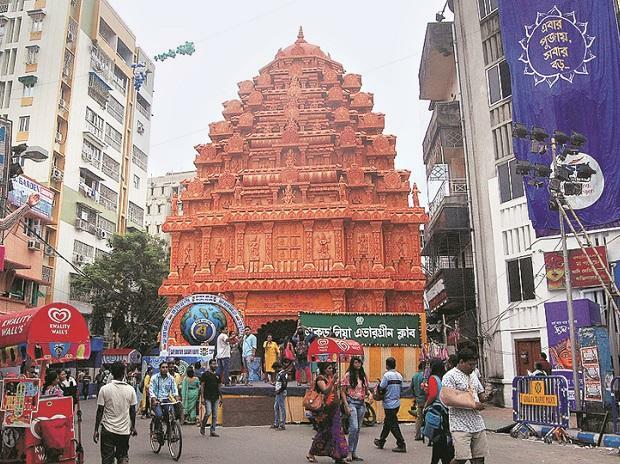 Another committee member, Manoj Ghosh, said: "As organisers, we want women to be included in the Puja but this is not our Puja as we have to follow whatever the tantrics say." "I am one of the aged priests here and I know there are no such rules that prevent the entry of women. Our temple is open for all and I am wondering who are those priests talking about such restrictions," exclaimed Mulmantra Roy, 81. "People come in large groups and the ground that you can see beside the marquee helps in managing the crowd. We allow them to worship from outside. The restriction is really surprising as the Goddess herself is a woman, but it cannot be changed," Gangaram said. Commenting on the reason cited by the organisers, Indologist Nrisingha Prasad Bhaduri said: "This is particularly a patriarchy-induced condition. Most of the Shakti Pujas are done following the tantra rituals and such practice is not prevalent anywhere. Finally, if the tantric has so many problems, then why are they worshipping the female goddess?" "This is not logical and they are projecting a sort of vainglory," Bhaduri affirmed. The women residents of the area seem least bothered about the restrictions as they don't want to break the age-old tradition. "I have seen this Puja when it started during my childhood days. Women can be part of the procession of bringing the idol and also join the visarjan (immersion procession). But once the rituals of the Puja begin, we cannot step inside the pandal. This has been the rule and we have followed it with devotion," Mithu Mantri, a woman resident said.